My bedroom has sorely been in need of some color or visual interest on the walls. It's also been in desperate need of beautiful matching lamps to sit on those new nightstands. This past weekend, I solved both with a trip to Pier One (for the Serena Accent Lamps) and a crafty easy DIY project to liven up the space! She does it cheaply and quickly, and you can too. Lay out your contact paper and draw your design. I used my bedspread as inspiration and drew larger versions of elements from it to tie the whole room together. As you draw, decide which places you'd like your paint to appear and make sure you've cut those spaces OUT using a scissor x-acto knife. Be careful to keep your designs simple or you won't be able to keep the stencil from sticking to itself once you remove it from the protective backing of the contact paper. Once you have your design and you've cut out the spaces where you'd like the paint to appear, pull the remnants of the contact paper away from the protective backing (so you've made yourself a giant sticker). Place said giant sticker on the wall and prepare for painting. Smooth your hand over your stencil as you adhere it to your wall. Do not worry, it will not take paint off your walls (at least it didn't at all with mine). Use a foam brush to paint on top of the stencil and fill in all your spaces. Immediately pull the contact paper stencil away from the wall and you'll have a gorgeous, crisp design ready to go. If your stencil isn't too wet at this point, you can do what I did and reuse it on another part of the wall. Tip: You can also use the remnants from the original stencil (the stuff you cut out to make a space for the paint) to make an inverse design. I did this and alternated on each wall. If you are wary of free-handing your own stencils, you could always trace a design onto contact paper using carbon paper. This whole project took about 2 hours and cost about $5 worth of paint + contact paper. I am incredibly pleased with the results and even more happy because I won't have to paint all that much back when I move out! Now, all I need is curtains. Stay tuned for the further evolution of Annie's bedroom makeover. Submitting to today's DIY Showoff! Submit your favorite DIY show-off projects here. Hello one and all! I'm delighted to announce that the folks at CSNStores.com and Allchildrensfurniture.com are partnering with me to bring you my first ever BLOG giveaway! 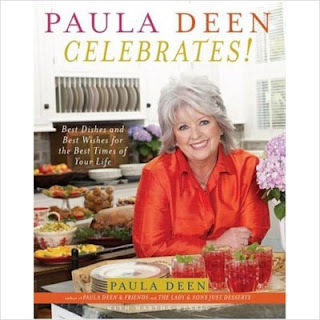 This amazing cookbook from Paula Deen. I really enjoy Paula's incredible love of all things majorly delicious, the amount of butter be damned! Since I've never done a giveaway before, I wanted to give all my readers a quick heads up. You can enter beginning Monday, March 1-Wednesday, March 3 at 5pm PST and all the details for entering will be announced on the blog on Monday. Followers (via Google Connect) will be given an extra entry so if you enjoy the blog and would like to join the followers ranks- please go ahead and do so! There could be deliciousness from Paula Deen awaiting you. Also, don't forget to stop by tomorrow to see what craziness I've been up to in my bedroom. Check out the cryptic hint from Monday here. I have done it! Another original recipe - this time for baked potato soup. I'm a bit of a starch fanatic and potatoes are definitely one of my dearest food loves. When I get baked potato soup at restaurants, I'm always a bit put off the base is more "cream of potato" and less "delicious cheddar." On that note, please enjoy this Annie recipe for the slow cooker! Combine the following ingredients: all of the soups, the diced potatoes and onions, and 3 strips of bacon in a crock pot and set to cook for 5-6 hours on HIGH. The potatoes will take a long time to cook, fyi. With about an hour left to go, add most of the colby jack and white cheddar to the crock pot mixture. Set the rest aside as a topper. When you're ready to serve, sprinkle green onions, crumbled bacon (from the 3 remaining strips), and the remaining cheese on top. Voila! Awesome in a bowl. I got wonderfully busy decorating this weekend and will reveal all of the amazingness this FRIDAY. What the hey could that be?